Soft Drinks have always been one of the most aggressive brands on traditional marketing channels. Along with fashion and F&B brands, they bank highly on visibility and brand ambassadors. And this is precisely the reason why I am a little surprised with the way they have been using social media. Not many are using social media the way it is intended to be used as there is a huge influence of traditional marketing mindset in their social media activities. Barring Pepsi & Slice, I felt many of the brands can do more to engage with their audiences and get more benefits from social media. Read on to know which ones, why Pepsi & Slice are so good and what the others can do to catch up! If you aspire to become a mass brand, you HAVE to build a huge community around yourself. Gone are the days when a community size of 1 million on Facebook was a great deal. There are now over 100 million Indians on Facebook and if your community has less than 1% of them, you are doing your community building wrong. 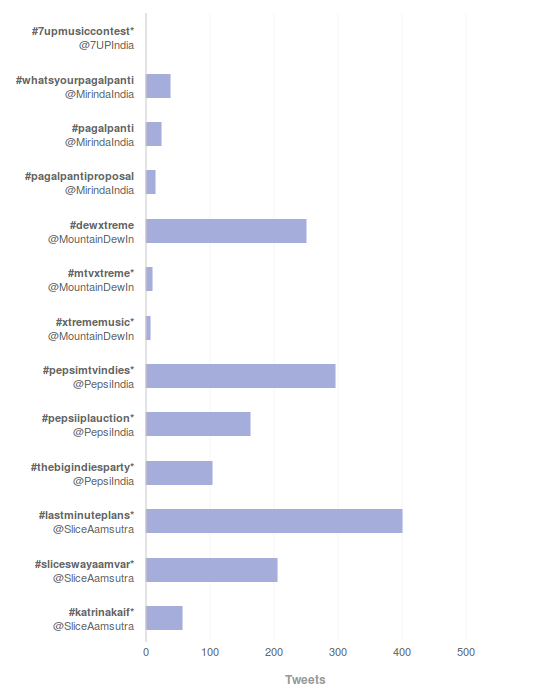 As you can see from the graph above, these brands are yet to build a strong follower base. Only Pepsi seems to have realized the worth of a fan base and has left everyone behind. 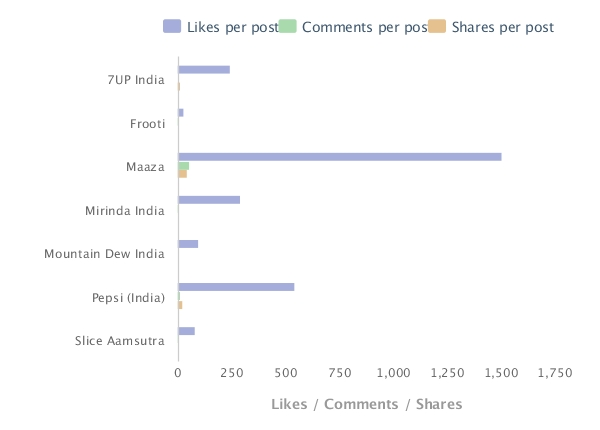 These brands don’t even seem to be making much effort to grow – infact 7Up lost fans in the time period analyzed. 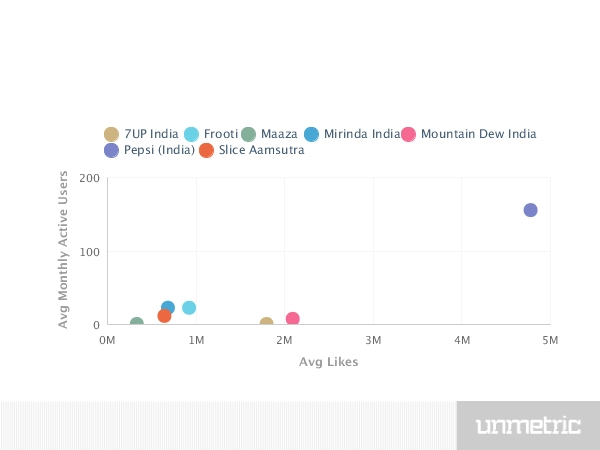 Coca-Cola, which we haven’t included in this report because they have a global page instead of a country targeted page, has over 2.5m fans from India, which puts them second but still well behind Pepsi. The fastest a brand grew in the 30 day period was Slice Aamsutra (at just 2%) which is quite low considering they have less than 8 lakh fans. I would really hope to see these brands spend more money on Facebook advertising (although definitely not resorting to buying votes!) to increase their community size. Building a tribe around their communication will not only help them increase their reach but also help them in executing impactful campaigns. The scenario is same on Twitter as well. These brands are hardly making any efforts to grow their follower base. Barring Pepsi, most of them have a follower count less than that of a typical social media “influencer”. In all this, I wonder why such big branding-intensive products have a miniscule social media presence. 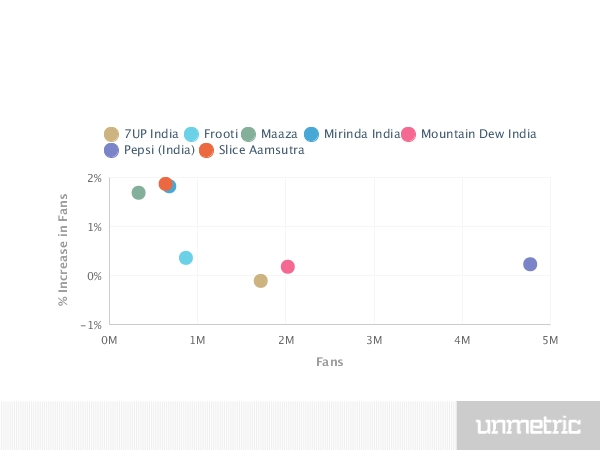 Leveraging online-offline campaigns along with strong tie-ups with influencers can help them grow their community to great heights – exactly the way Pepsi went about during last year’s IPL. 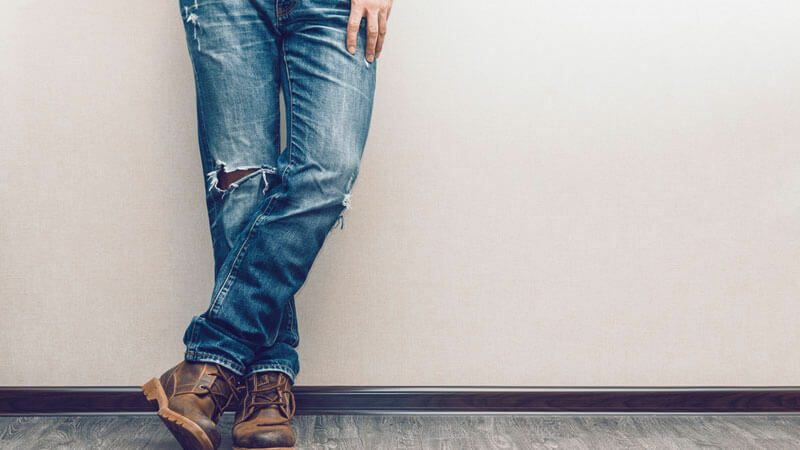 Since these brands are very well known among the masses, it shouldn’t take them much effort to get started. These brands don’t stick much to the “Post 2-3 times a day” philosophy. They share little and they converse even less. However, the frequency and number of updates can suddenly take a jump when there is any product/campaign launch. Otherwise, there is very little to talk about when it comes to posting schedules. Let me take each brand and share its content strategy with you. Pepsi’s content revolved primarily around the IPL, T20 World Cup and MTV Indies for the time period studied. 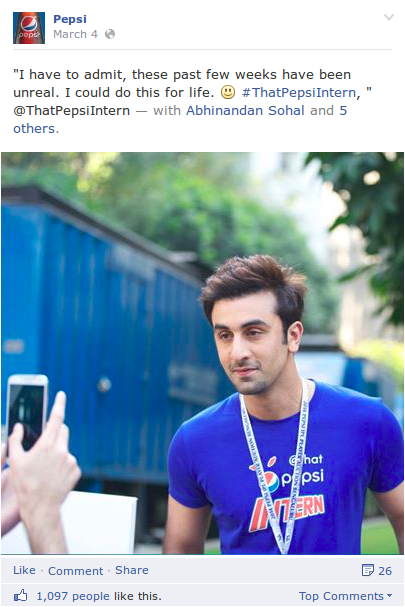 They are leveraging Ranbir Kapoor in a great way with their @ThatPepsiIntern campaign which has caught up big time with people on Facebook and Twitter. Owing to its association with Music & Cricket, Pepsi’s voice is youthful, peppy and has an infectious energy in it! 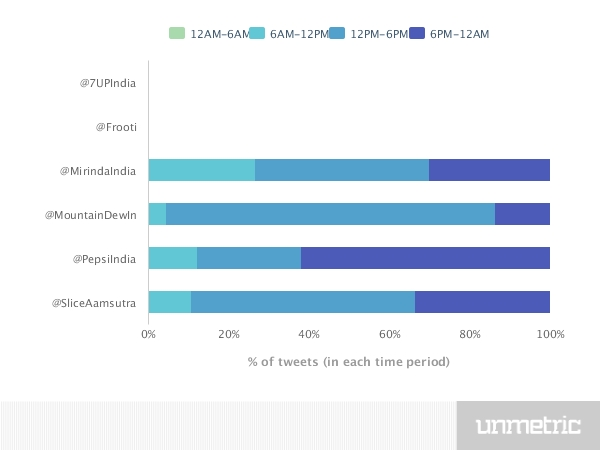 Also noticeable is the fact that Pepsi tends to tweet more often after 6 PM. More than 60% of its tweets are between 6 PM to 12 Midnight which is markedly different from the rest of the brands on Twitter. Seems like Pepsi has realized that its audience is much vocal and interactive later in the day than in the mornings and noon. 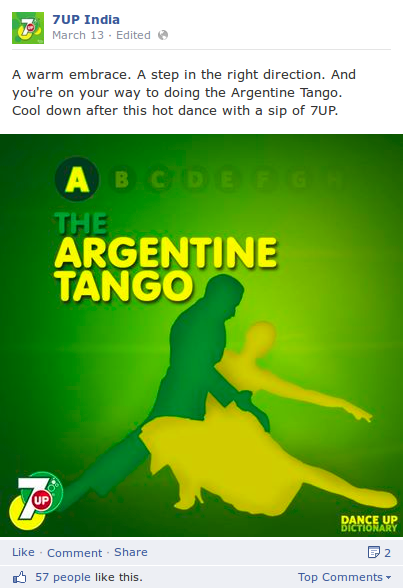 7UP has shared very little content on FB. Even though they are good with their creatives, they are doing very few things on social media to talk about. Whatever handful of updates they shared were revolved primarily around dancing since that is what the brand resonates. The fact that they are creating content around their brand personality is commendable. 7UP needs to step up its game on Twitter, however, as there are hardly any tweets from its handle. There are plenty of Twitter users who are into dance and leveraging them with quality engagement will definitely give a boost to their presence on Twitter. 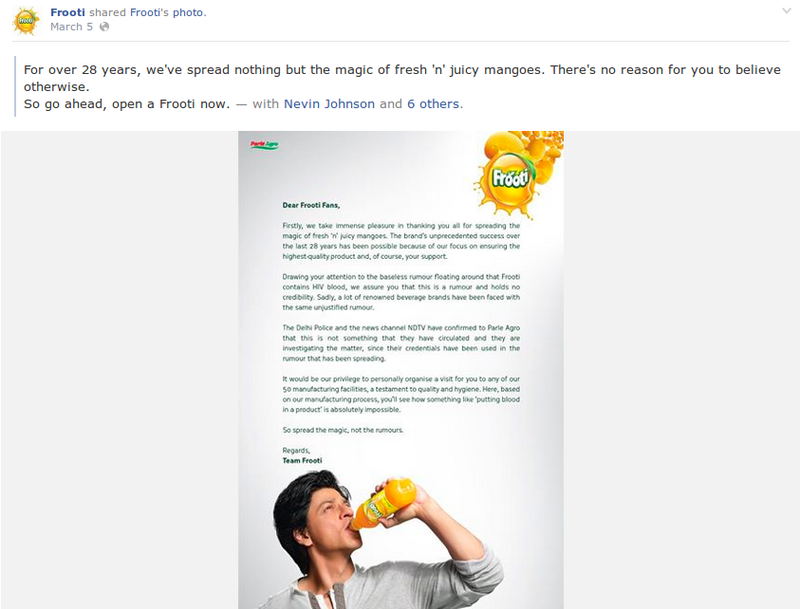 Frooti has made only one post on Facebook in the entire 30-day period which was a response to a PR crisis around it. Apparently there are some utterly bizarre rumors going around that HIV positive blood is mixed into Frooti, so the brand took to Facebook to quell those rumors. It’s good to see that Frooti understands the importance of social media to dissipate rumours surrounding its brand, but without the content to build brand evangelists, the message won’t be spread amongst the community. How can you be a mango pulp drink and manage to be boring? Maaza will tell you how. The brand has some uninspiring updates with old hat copy and creatives. It is neither interesting nor is it trying to be organically engaging. It reminds me of brands who have just joined social media and what we were seeing a few years back. The creatives need to improve a great deal and the copy needs to strike a chord with the audience. If you’re positioning yourself as a “Har Mausam Aam” (Mango for all seasons), you need to ensure that your copy forms a bond with the person who is yearning for a mango but can’t wait for summer. 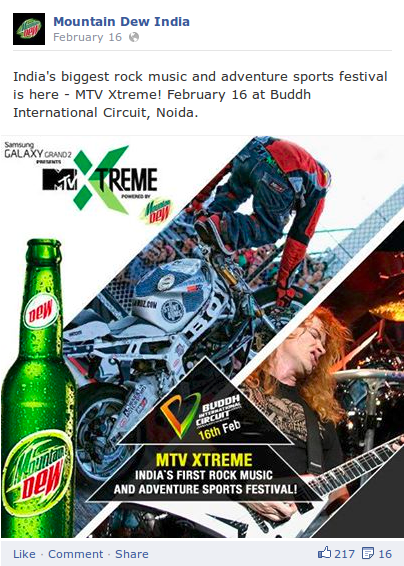 The content strategy of Mountain Dew revolved around the MTV Extreme Rock Music scene as it shared content around the event and also about rock music. Being an energetic brand, the association was good but could have been better if there was less promotion around the event. 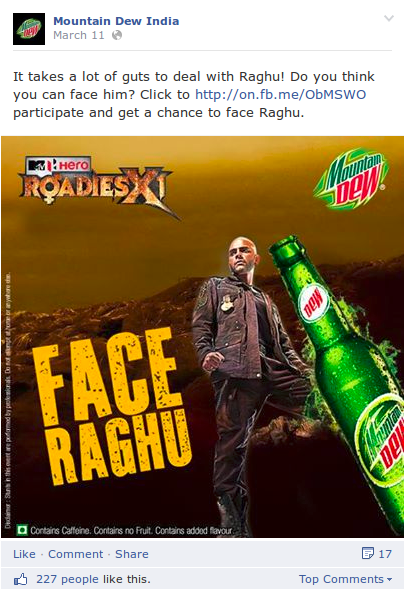 Currently, Dew is talking all about Roadies and is again going on a promotional spree instead of riding on an energetic content strategy. Instead of going promotional, Mountain Dew can actually create content around the guts required to participate in Roadies. Roadies has got a huge fan following and riding on the wave with some interesting content will definitely give Mountain Dew a great push. 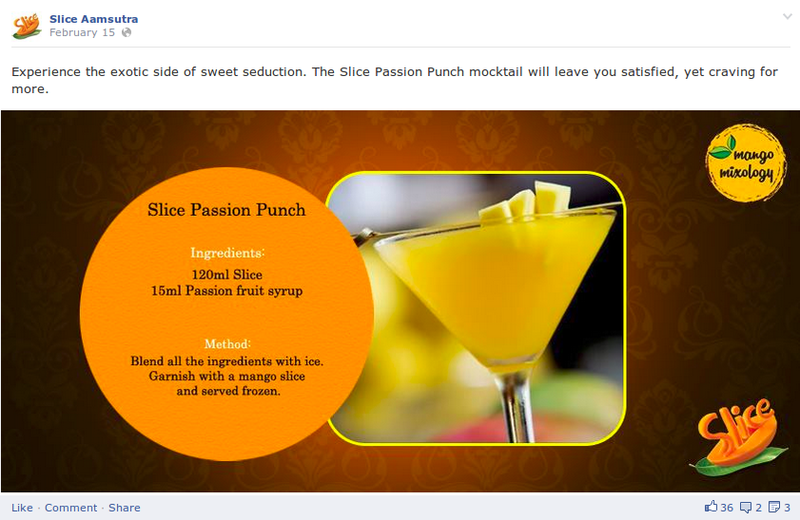 I liked Slice’s approach towards content and it shows us how a mango drink should do social media. The content clearly showcases the indulgence and temptation that has been its approach since Day 1. The images and copy talk clearly in the tonality that it is intended for. 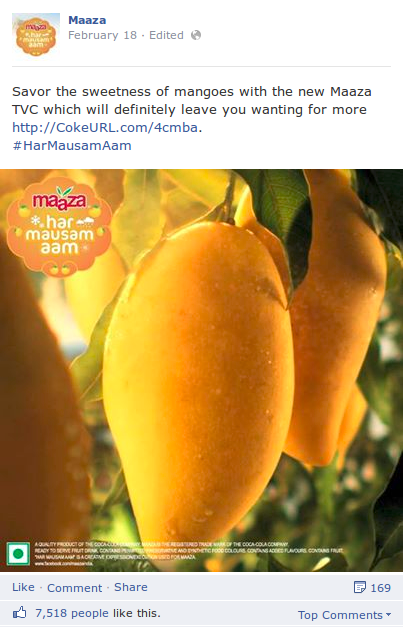 Maaza could learn quite a lot from Slice on what people like to see and what they engage with. Slice also shared interesting cocktail recipes around mangoes and Slice, which is a smart way to promote the product to masses. The content strategy is very similar on Twitter as well and is highly conversational with its audience. Slice makes sure that it replies to as many mentions as possible, which is much better than even a service oriented brand. The latter half of the period studied, however, was dominated by teasers for the SwayAAMvar campaign. Slice should have struck a balance and continued the sharing the cool updates it was sharing previously. 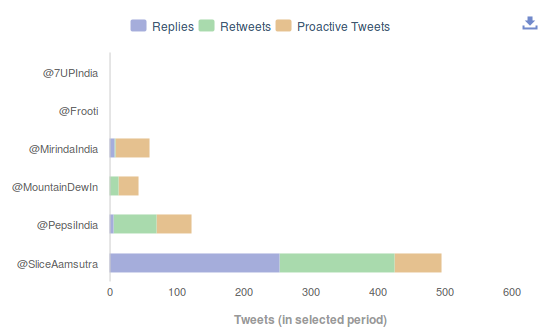 When it comes to conversations, however, Slice is the most responsive to tweets. More than half of its tweets in the time period studied were replies to people and engaging them with conversations. Unlike Pepsi & Mountain Dew, Slice is tweeting more and understands the importance of communicating with the audience on Twitter. The second half, however, is talking only about its TVCs, its campaign to crowd-source ‘pagalpanti’ ideas and content around sports. The strategy could do with some fresh input though as it has average creatives and copy. 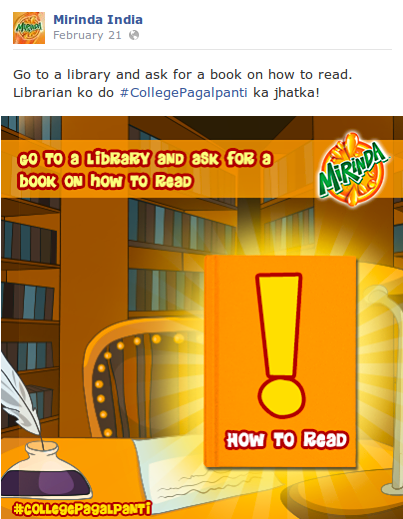 With a topic like Pagalpanti, Mirinda can create a lot of video content with college students and young professionals. In place of lacklustre images, videos will definitely resonate more. Also, they can leverage the stardom of Asin, the same way Pepsi is doing with Ranbir Kapoor. 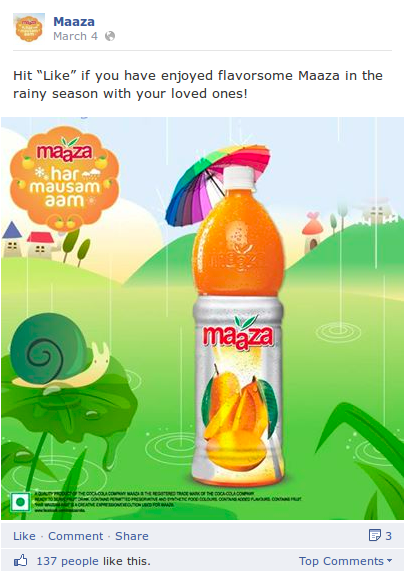 Even though I disagreed with Maaza’s content strategy above, I can see it doing really well in terms of engagement. 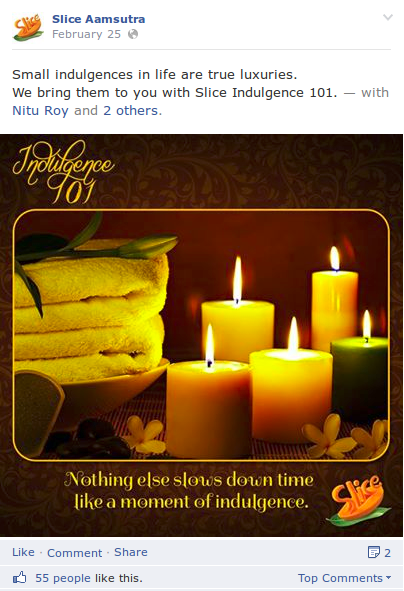 With an average of 1500 likes, 53 comments and 44 shares on its Facebook updates, it’s miles ahead of the pack. Even apps on the Facebook pages of these brands are not able to drive up that much engagement. 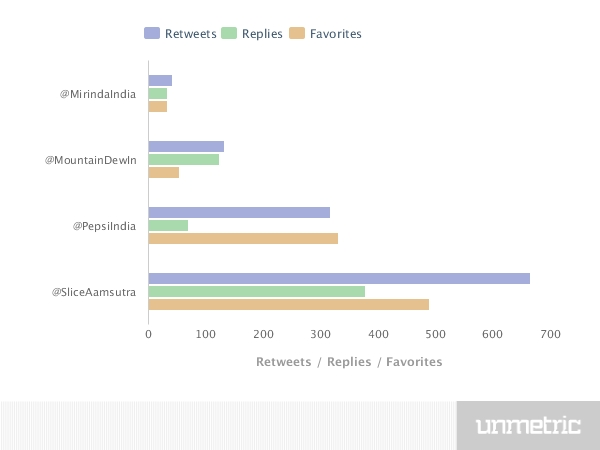 Despite having the largest fan base, Pepsi has just 150 monthly active users for its apps, and is the leading the pack. Either they are plain boring or are not being promoted at all. Maybe they should be replaced with apps that gamify the user experience and engages them. On Twitter, Slice is winning the game by scoring the maximum number of Retweets, Replies and Mentions. The high engagement is because of the seeding of its SwayAAMvar campaign which made people curious and talk about it. The #LastMinutePlans hashtag also generated a good amount of engagement for Slice. 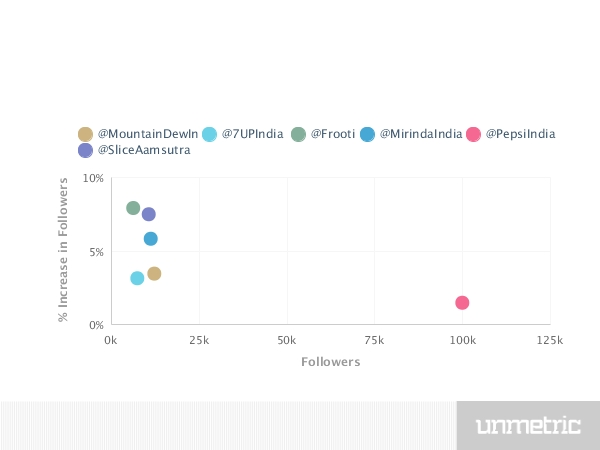 Meanwhile Pepsi managed to engage the Twitter verse with its hashtag campaigns around the IPL auction and the Pepsi MTV Indies launch. It is clearly evident that sponsoring big ticket offline properties has managed to create online buzz for Pepsi. Maybe other soft drink brands can take a cue or two from them? Another way to increase engagement would be to create impactful campaigns that resonates with the TG of these brands. Using technology such as RFID (Radio Frequency Identification) and Augmented Reality, they can come with some really interesting activites that can generate huge buzz on social media. 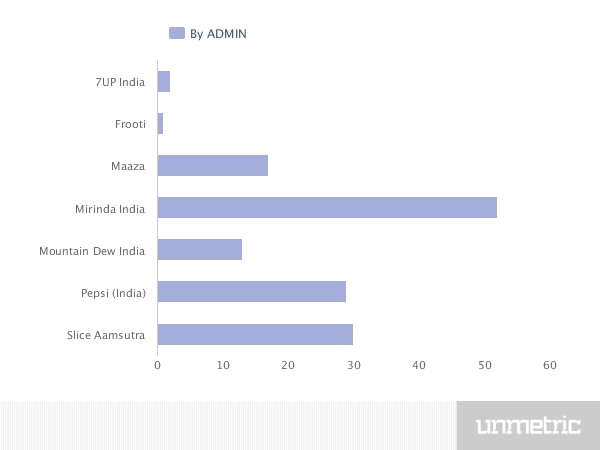 Note: Unmetric was unable to calculate the engagement for 7UP and Frooti on Twitter because these brands didn’t do anything in the period studied. 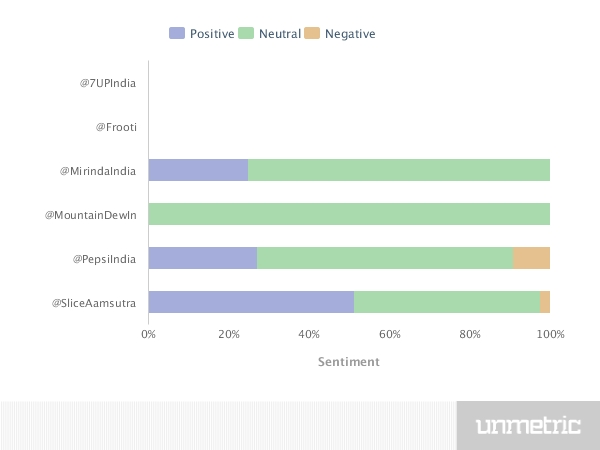 The sentiment of tweets that these beverage brands reply to on Twitter is mostly positive or neutral but this doesn’t come as a surprise as there’s not too much negativity that you can direct towards an FMCG product – unless the brand has had a PR disaster. To be honest, I am disappointed with these beverage brands. I expected them to be really cool on social media, like the way they are on TVCs and Print. I was disappointed to see many of them floundering with their content strategy. They need to streamline their efforts and focus on putting the best foot forward instead of generating content for the sake of it. They need to become a little more interesting and engaging, especially Frooti and 7UP. Also, creatives play a big role for these brands. Pepsi, 7UP & Slice have some really good designs and Maaza should learn from them. Overall, these soft drinks majors have a huge scope of improvement which can be solved with just a few tweaks in the content strategy. What is Experiential Marketing and How it can Help Brands Build Social Presence?